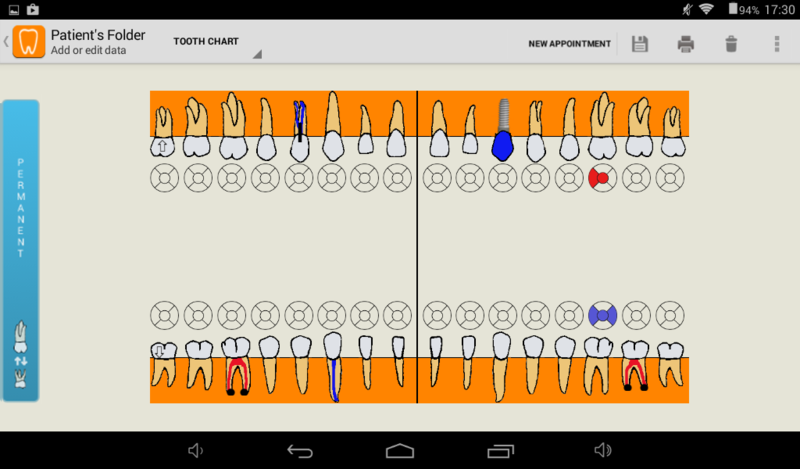 Cusp is an application designed to assist you in your general dental practice. It features a really easy to use interface, a detailed database for storing your patients, a scheduler to keep your appointments synchronized with your Google calendar, backup and restore using Dropbox and many, many more at an affordable price. 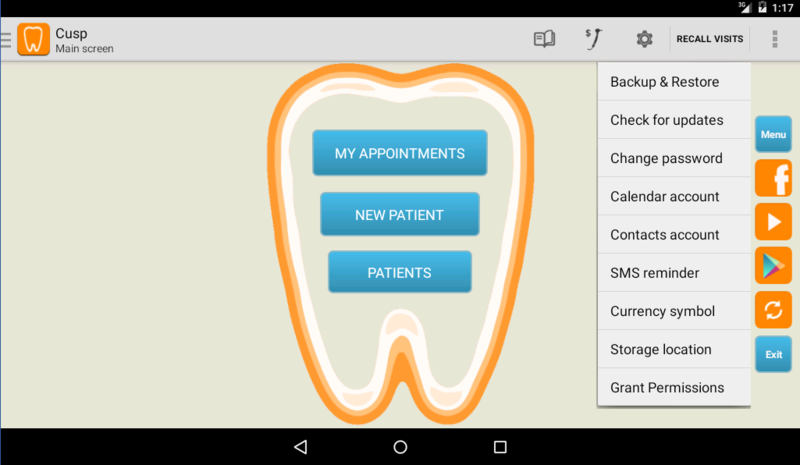 Our goal is to provide a simple, yet powerful tool for the dentist's tablet and smartphone, with free updates and without annual fees. Don't forget to check for updates regularly! First version: Cusp 1.0 was released in February 2014. 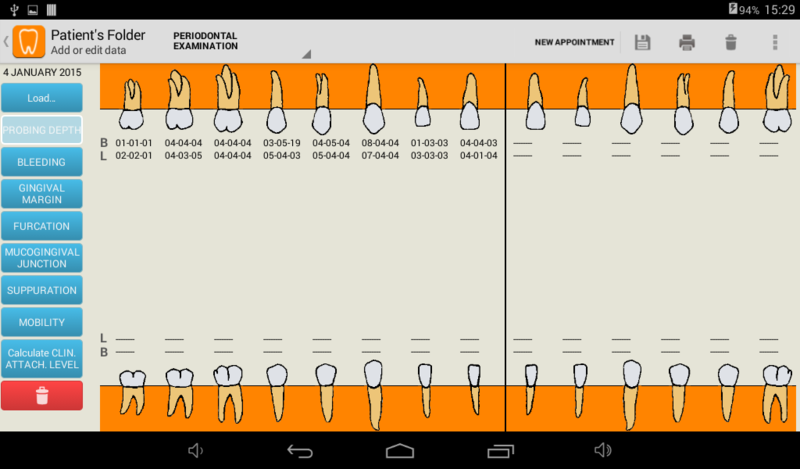 The patient's folder is organized in easy-to-browse swipable tabs: General profile info, medical anamnesis, oral examination, photos and radiographs, full odontogram, periodontal examination, payments history, treatment plans and follow-up system. 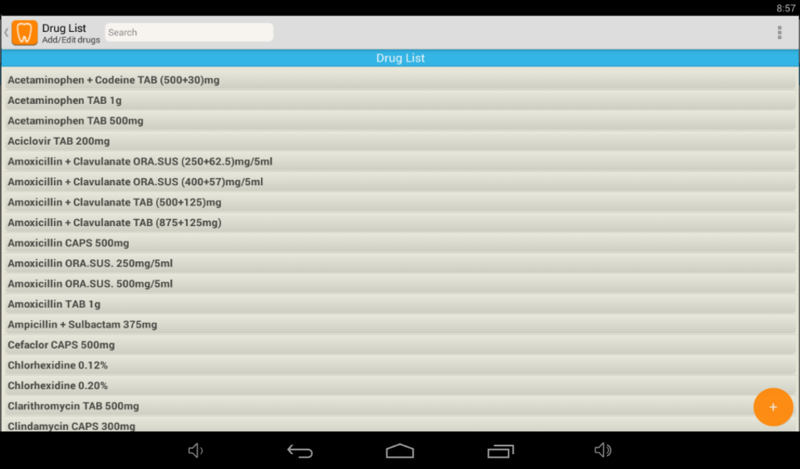 For every patient, Cusp enables you to select the sections you want to print or export to PDF. 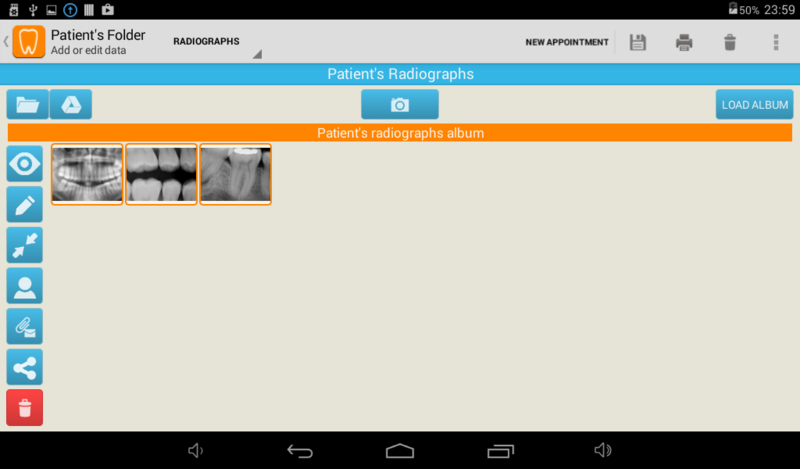 These include general info, medical history, oral examination, treatments and payments, charting and treatment plans. 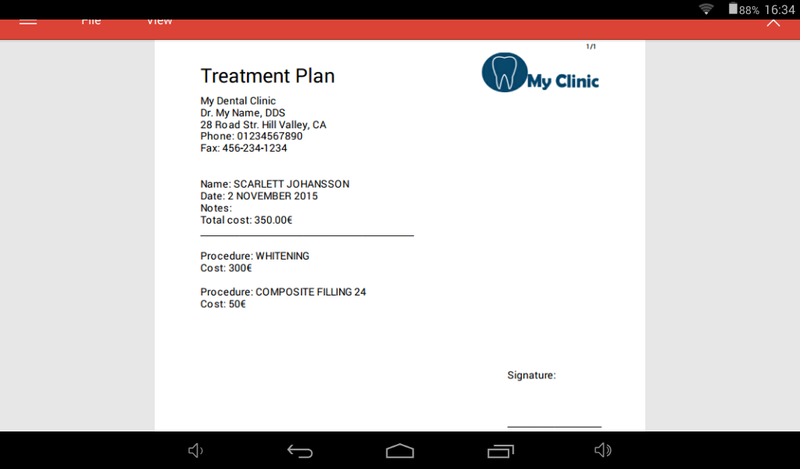 You can also add your business dental logo in the documents. 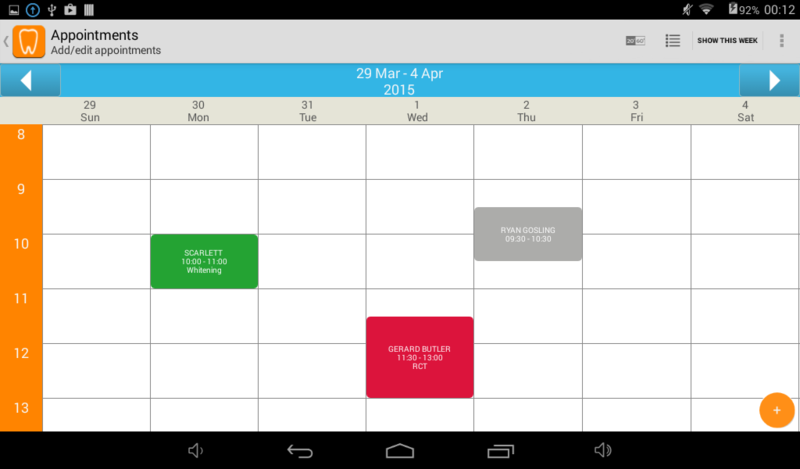 Cusp uses your Google Calendar to synchronize appointments. 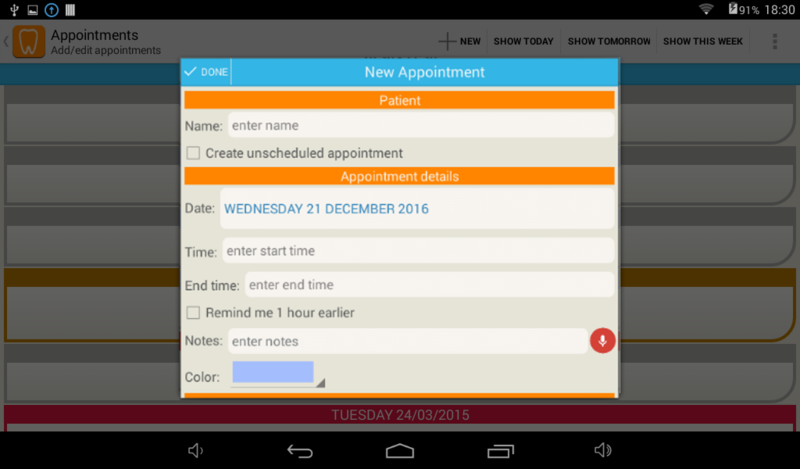 A simple interface with shortcuts and auto-completed text helps you arrange your appointments faster. On-line backup and restore in your Dropbox account are available. With Remote Access, you can transfer your data to other devices. 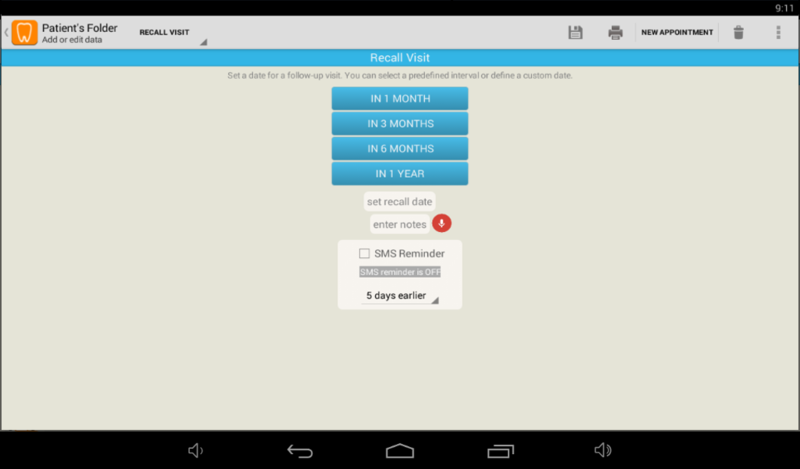 If you are using a smartphone or telephony-enabled tablet, you can schedule a SMS reminder for your patients 1-5 days before the date of the follow-up examination. Cusp can create a backup of your data inside your device or SD card or directly to your Dropbox folder. 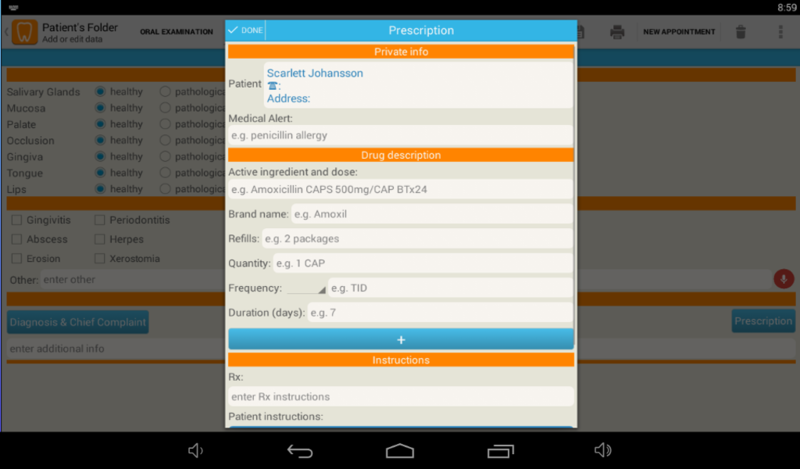 A customizable list with all your treatments, prices and laboratory expenses helps you manage your practice easier. 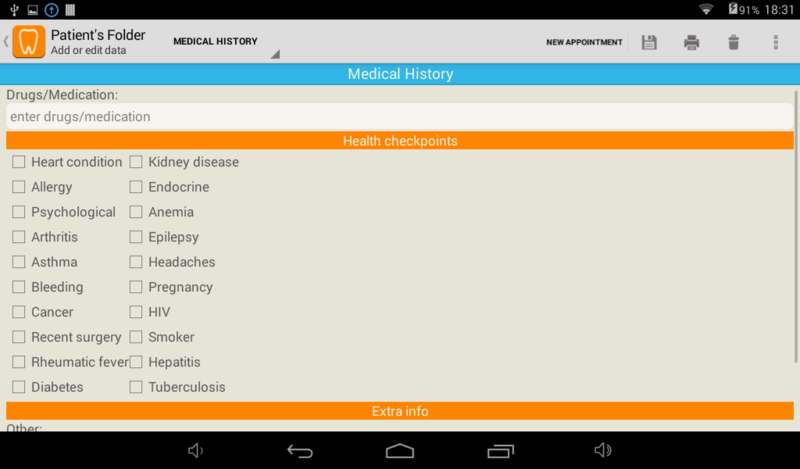 All these are linked to auto-complete text fields for easy entry in patient's treatment history. 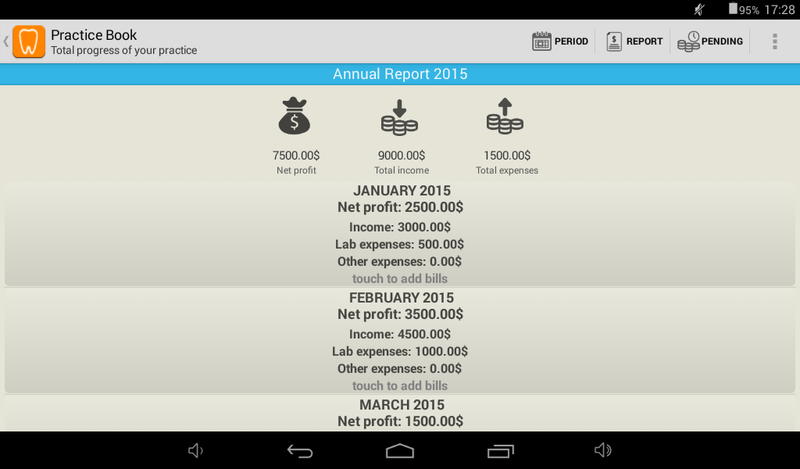 Cusp keeps track of payments and remainders for each patient and calculates your monthly income, expenses and net profit. You can export to PDF/print the payments/expenses for a selected period. A special list with all pending payments is also available in the Accounting Book. Easily build a list with your patients' health plans and keep track of insurance payments. 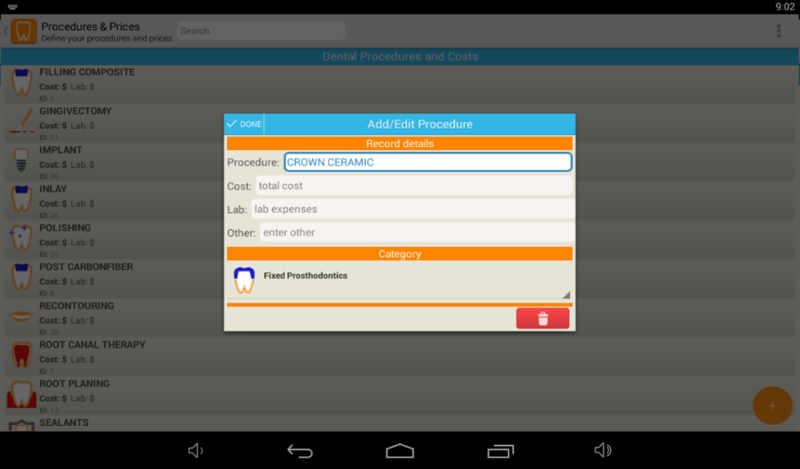 Organize your private dental practice with an Android device. Try Cusp now! Purchase is very simple. All you need is to login to Google Play Store and search for Cusp. If your device doesn't have Play Store installed, you can purchase Cusp from Amazon App Store. To install Amazon App Store on your device, open this link and follow the instructions, or download the apk file directly. Your credit card will be charged only one time, at purchase. There are no annual fees for the Standard edition. Furthermore, once you purchase the Standard edition, you are allowed to install it on your other devices at no extra charge. How much does Cusp cost? Visit the page of Cusp at the Google Play Store or the Amazon AppStore to see the price in your currency. In this way, you are able to access your files from different devices, simultaneously. 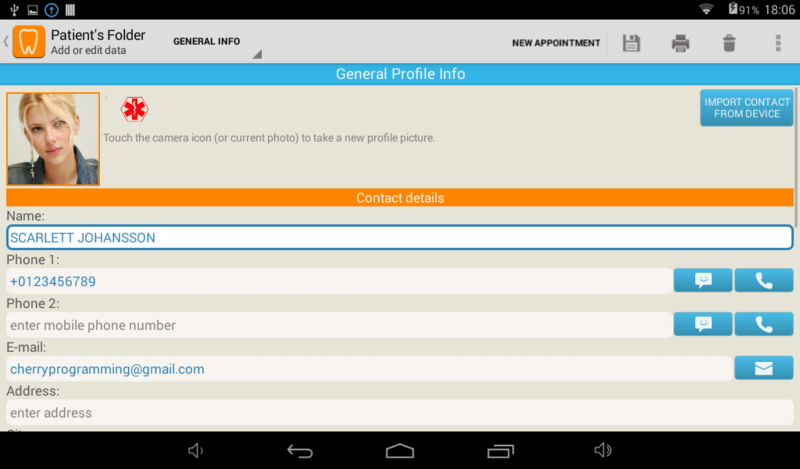 Cusp Cloud is an optional upgrade which saves all your patient data in the Cloud automatically. By upgrading to Cloud edition, you won't have to worry about unsynchronized data among your devices any more. 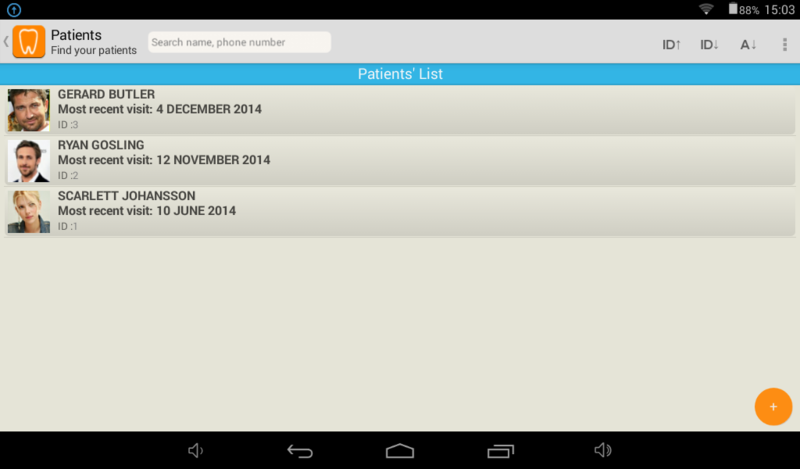 For example, a change you make to a patient record on your smartphone, will be reflected on all your other devices and vice versa. The Cloud also protects your data in case of device theft or damage. Cusp Cloud is available via Google Play Store as a subscription. 1. What are the application's minimum system requirements? An Android mobile device or a PC/Mac with BlueStacks installed. For the SMS Reminder, the device must contain a valid SIM card (2G or higher) with telephony capabilities. Please note that some tablets utilize the SIM card only for Internet access. In this case, the SMS/calling functions of Cusp will not work. Blackberry 10 devices are also compatible. Not compatible with iPhone and iPad. 2. Will I lose my data if my device stops working or lost? In Cusp Cloud edition, your data are automatically stored both in the Cloud and in your device. In this way they are safe in case of device theft or damage. Cusp Standard edition allows you to create an online backup of your data in your private Dropbox folder. In case your device is not accessible anymore, you can restore your data on another device using the Cusp Remote Access menu. Google Play Store will allow you to download and install Cusp on the new device without paying again. It is highly recommended that you create a backup in Dropbox everyday, to keep your data safe and up-to-date. 3. I cannot purchase Cusp. Why Google Play Store is not accepting my card? Click here to see the possible solutions. 4. Can I install Cusp on more than one device without paying? 5. What languages are supported? Cusp contains translations for English, Русский, Español, Português, Română, Italiano, Türkçe, Ελληνικά, Hebrew, বাংলা and العربية . The application detects the language setting of your device and automatically applies the correct translation. If your device does not support one of the languages above, then in order to use Cusp in your preferred language you must install the app SetLanguage. 6. How are my appointments synchronized with my Google calendar? 7. If I install Cusp on more than one device, are my data synchronized automatically among them? In Cusp Cloud edition, yes, they are. 8. What do I need to enable printing in a Wi-Fi printer? You need a device with Android 4.4 KitKat or higher and a Wi-Fi printer installed. Also, your device must contain the Printing Service, that means that you can find a "Printing" option in your device "Settings". Only then you can install a printer. 9. I want to add new appointments to my Google Calendar from my computer or other device. Will Cusp see these? If you want your Google Calendar appointments be shown in Cusp, write the word "CUSP" in the "Event Location" field when you create a new event using Google Calendar. 10. My appointments are saved in wrong hours. How can I fix this? Cusp uses your Google Calendar and your Time Zone settings in order to properly save and display your appointments. 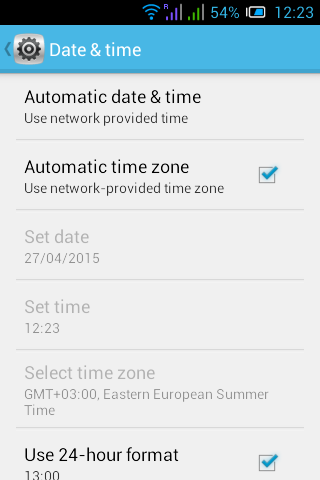 Please make sure that your device's "Date & Time" is set to Automatic Date & Time and Automatic Time Zone and that you use the Network provided date & time. 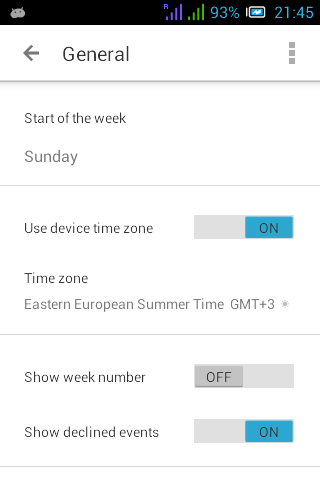 Also, in your Google Calendar "General" settings, you must switch ON the Use device time zone option. 11. What is the initial password to login? The password is 0000. You can change it from the Settings on Cusp Main Screen. 12. Can I create a backup in my external SD card? Depending on your device's brand, model and Android version, Cusp will try to detect the SD card and export a backup of your data there. Exporting to SD cards may not be possible for every device. Please, always check if the backup files are successfully saved in your SD card using your device File Explorer, after the backup is complete. 13. Can I create a backup in a USB flash drive? Yes, if your Android device supports USB OTG (on-the-go). 14. 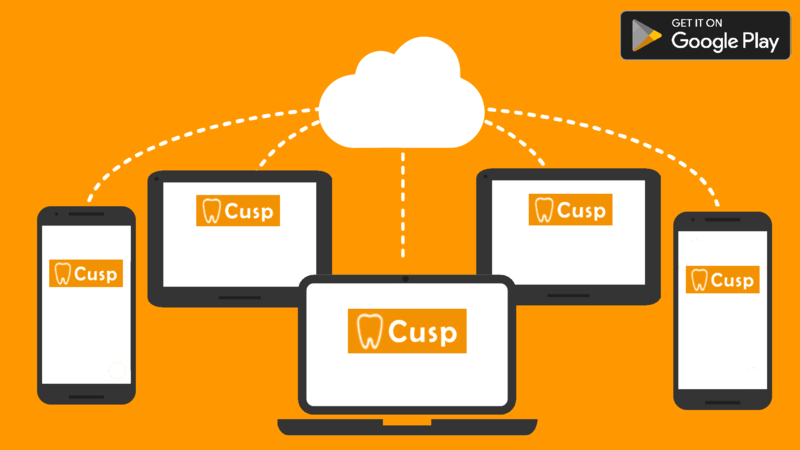 Can I install Cusp on my Windows PC/Mac? Although Cusp is designed for real Android devices, you can also download and install it on your PC/laptop using the BlueStacks emulator. BlueStacks contains Play Store where you can install the demo version of Cusp, or purchase the full version. 15. Cusp Cloud Edition - Important things to know. Cusp Cloud is an optional feature. If you don't want to upgrade, Cusp will continue to operate as usual, with regular updates. Backup, Restore, Dropbox Backup and Restore (Remote Access) are disabled in Cusp Cloud edition. The billing can be annual or monthly. You can cancel the subscription any time. When you cancel a subscription you will still have access to your subscription for the remainder of time you have already paid for. Get more information and instructions here. If you have any question about the application or have discovered a bug or a translation mistake, don't hesitate to send us an e-mail. If you want to share your ideas for improvements, please don't use the e-mail but write in the forum or in the Facebook page instead. We are constantly working to improve Cusp!